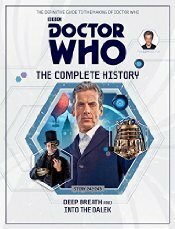 Volume 17 (2nd delivered volume) of Doctor Who: The Complete History features episodes starring The Twelfth Doctor: "Deep Breath" - In Victorian London, the appearance of a Tryannosaurus Rex in the Thames heralds the arrival of the TARDIS. Clara and the newly-regenerated Doctor join forces with the Paternoster Gang to investigate several instances of spontaneous combustion; "Into the Dalek" - The Doctor is intrigued when he encounters a Dalek with a conscience. Determined to discover how such a thing could have happened, the Doctor, Clara and a group of battle-weary soldiers are miniaturised and explore the Dalek from the inside out.